Venezuelan opposition leaders Leopoldo López and Antonio Ledezma have been re-arrested in a move condemned internationally. Leopoldo López and Antonio Ledezma were under house arrest after accusations of inciting violence during anti-government protests in 2014. They have been taken to Ramo Verde military jail, family members say. The court also said that it had revoked Antonio Ledezma’s and Leopoldo López’s house arrest because they had made political statements. The UN’s High Commissioner for Human Rights, Zeid Ra’ad al-Hussein, said he was “deeply concerned” that the pair had been taken back into custody. The move comes just two days after a controversial vote for a constitutional assembly saw violence on the streets, with at least 10 people killed. President Nicolás Maduro convened the assembly to rewrite Venezuela’s constitution amid spiraling anti-government protests on May 1. He argued that the move would create peace and foster dialogue by bringing together different sectors of Venezuela’s polarized society. However, the opposition accused the president of trying to rewrite the constitution in order to maximize his power and sideline the opposition-controlled legislature. They boycotted the vote and called on Venezuelans to take to the streets in protest. The election was condemned by Latin American leaders, the EU and the US. The day of the election was the deadliest so far since the current wave of protest began. US Treasury Secretary Steven Mnuchin announced on July 31 that the US had imposed sanctions on President Nicolas Maduro and called him a “dictator who disregards the will of the Venezuelan people”. Leopoldo López was taken from his home at 12:27 local time on August 1, his wife, Lilian Tintori, wrote on Twitter. 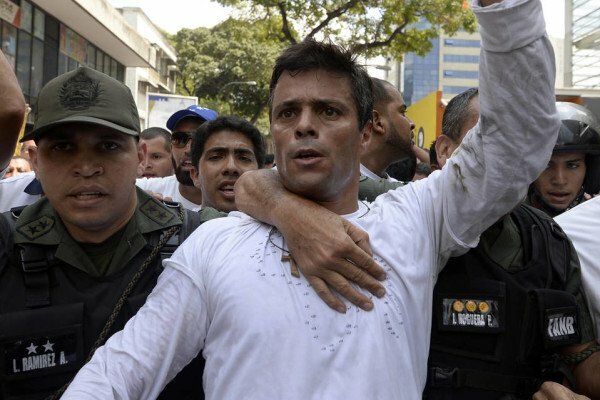 A video posted showed Leopoldo López being taken away by members of the Venezuelan intelligence service, Sebin. Lilian Tintori wrote that she would hold President Nicolás Maduro responsible if something were to happen to her husband. The daughter of Antonio Ledezma, Vanessa Ledezma, also posted a video of her father, wearing pyjamas, being taken away by the Sebin. The EU criticized the detentions as a step in the wrong direction and Chile’s foreign minister said they “sent an abysmal signal”. The US also condemned the arrests. Republican Senator Marco Rubio noted that VP Mike Pence has spoken to Leopoldo López on July 28, and characterized the arrests as a response to the sanctions placed on President Maduro. Both Antonio Ledezma and Leopoldo López were key figures in the wave of protests which swept through Venezuela in 2014 in which 43 people from both sides of the political divide were killed. Leopoldo López and Antonio Ledezma have played a less prominent role in the most recent protests because they have been under house arrest but their video messages still get reported and shared widely on opposition websites.